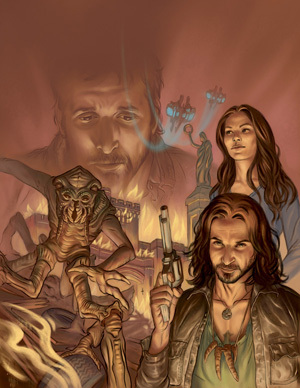 TNT and Dark Horse Comics have partnered again for the Falling Skies season two digital comic. The comic will be available beginning April 18 on FallingSkies.com and Dark Horse Digital. TNT’s epic drama Falling Skies, basic cable’s number-one new series of last year, chronicles the chaotic aftermath of an alien attack that has left most of the world completely incapacitated. Season two will premiere with back-to-back episodes on Sunday, June 17, at 9 p.m. (ET/PT). Dark Horse Comics began working with TNT over a year ago, publishing a free webcomic prequel toFalling Skies. The inaugural comic quickly sold out and was a fan favorite in advance of the series premiere. The upcoming digital comic series, Falling Skies: The Battle of Fitchburg, chronicles what happens to the Second Mass in the three months between when season one ends and season two picks up. With an army of skitters closing in, and the group sustaining heavy losses, the Second Mass shields itself in an armory in Fitchburg ready to finish the battle once and for all. Falling Skies: The Battle of Fitchburg will be released as free eight-page, biweekly comics featuring art by Juan Ferreyra (Rex Mundi) and scripts by Paul Tobin (Marvel Adventures: Fantastic Four, Marvel Adventures: Spider-Man). Fans can get a sneak peek of the animated trailer by visiting EW’s Shelf Life! This season will continue its extraordinary story about life and survival in the wake of a catastrophic alien invasion. Noah Wyle (ER) stars as Tom Mason, a former college professor and father of three, who has become an unlikely leader for the Second Massachusetts civilian resistance group. Falling Skies comes to TNT from DreamWorks Television and is executive produced by Steven Spielberg and DreamWorks Television heads Justin Falvey and Darryl Frank. Remi Aubuchon, Greg Beeman, andRobert Rodat are also executive producers. Fans can find the latest Falling Skies news online at FallingSkies.com and via @FallingSkiesTNT on Twitter. In its debut season, TNT’s Falling Skies averaged more than 6.9 million viewers, 3.3 million adults 18–49 and 3.7 million adults 25–54 to rank as basic cable’s number-one new series of 2011. On the international front, Falling Skies premiered in more than 115 global markets, achieving hit status in the United Kingdom, Australia, and Latin America, among others. The premiere of Falling Skies also ranks as the biggest series launch ever for TNT networks in Spain, Germany, and Austria.